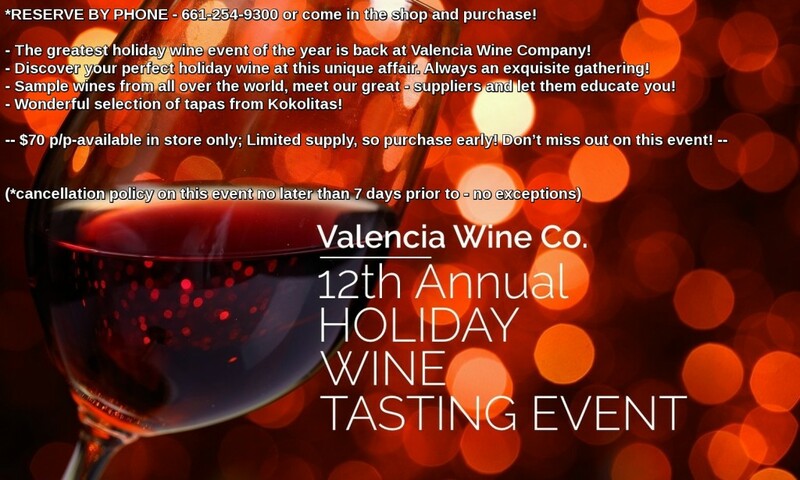 Will You Join us for the Valencia Wine Company Holiday Wine Tasting? It’s Their 12th Time! Guests will have plenty of time to taste wine from both domestic and imported sources – see our growing wine list below. All of the wines will be paired with both savory and sweet treats catered by the one and only Martha Aguilera, owner of Kokolita. Besides having the three hours to taste wine and food, guests will have a special treat – education, if desired, from the winery representatives. George Skorka – a wine representative serving during the event, that so happens to have a stellar wine pedigree as a sommelier and wine judge – has been devoted to Valencia Wine Company’s education program for many years. This is an event that guests look forward to as it’s an opportunity to learn and taste with George. The many wine representatives that will join George are very educated about the wines they are serving, so it’s pretty much a sure thing that if you want to learn more about what you are tasting, you will! One more thing: You should be able to get some of your necessary holiday shopping done! Each guest is given a tasting booklet that is several pages long; listing out all of the wines and their prices. And though my husband usually goes for a case (there is always a nice discount for buying a full case) I can’t be positive that all of the wine we purchase will be gifted to others. Keep your eyes peeled to the Facebook event page for Valencia Wine Co.’s 12th Annual Holiday Tasting because…I will be posting teasers there until the event takes place on November 14! Remember, the event is coming up fast, November 14, so you best call 661-254-9300 to reserve. We did!